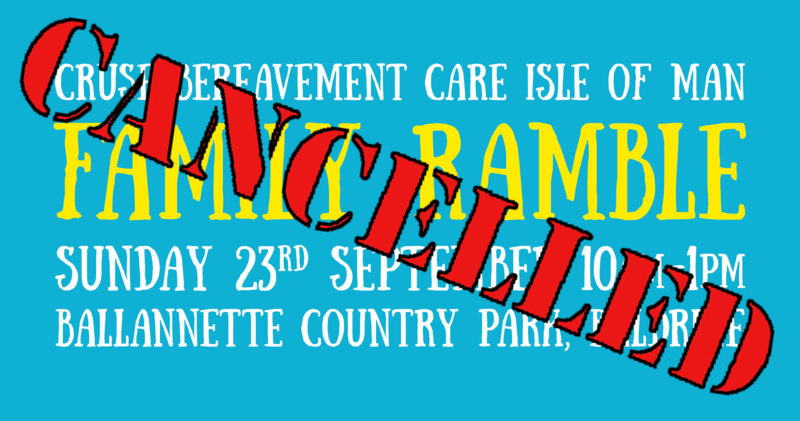 Due to a low level of interest, we’re sorry to say that the Family Ramble which was planned for Sunday 23rd September has been cancelled. If you know anyone who was thinking of going, please let them know. We’ll have people there on the day to tell anyone who may still turn up, but we’d much rather everyone found out before then. Hopefully we can arrange a similar event next year and we’ll let everyone know if we do. 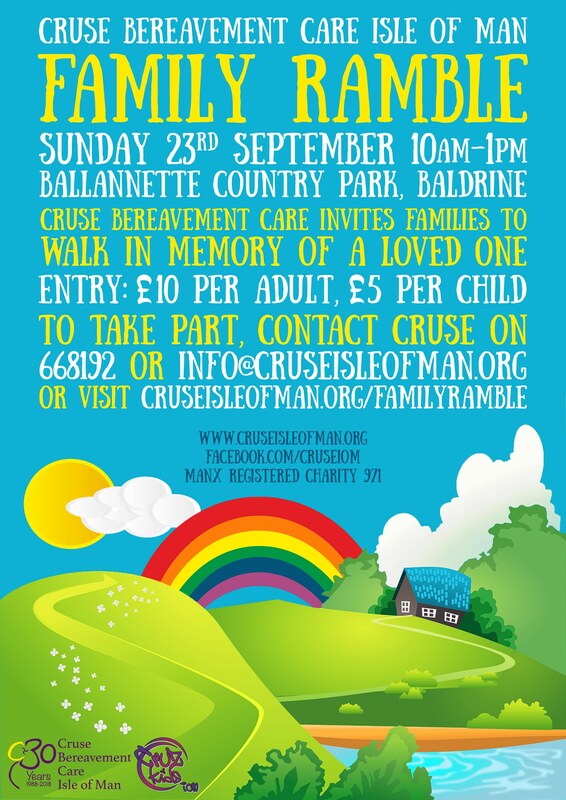 Our Family Ramble will be held at Ballannette Country Park in Baldrine on Sunday 23 September, 2018. Registration is from 10 am, with the walk starting at 10.30 am. This event is replacing the Footprints Memory Walks we’ve held in previous years, but the idea is the same. It’s a chance for everyone to enjoy a scenic, healthy and fun few hours with family and friends, while also helping to support the important work of Cruse. Some people may also choose to walk in memory of a loved one. There will be two walks available on the day. The short walk will take you around the ponds at Ballannette, while the long walk is around 2 km and will take you out over Clay Head, where you can enjoy a stunning view of the coastline and Laxey Bay! The entry fee is £10 per adult and £5 per child. Everyone is encouraged to raise sponsorship money, but don’t worry if you can’t - just come along on the day and have fun. You can send your completed forms and entry fee to us in advance or bring them with you on the day. If you’ll be bringing them on the day, please can you let us know you’ll be attending, so we can plan for numbers. 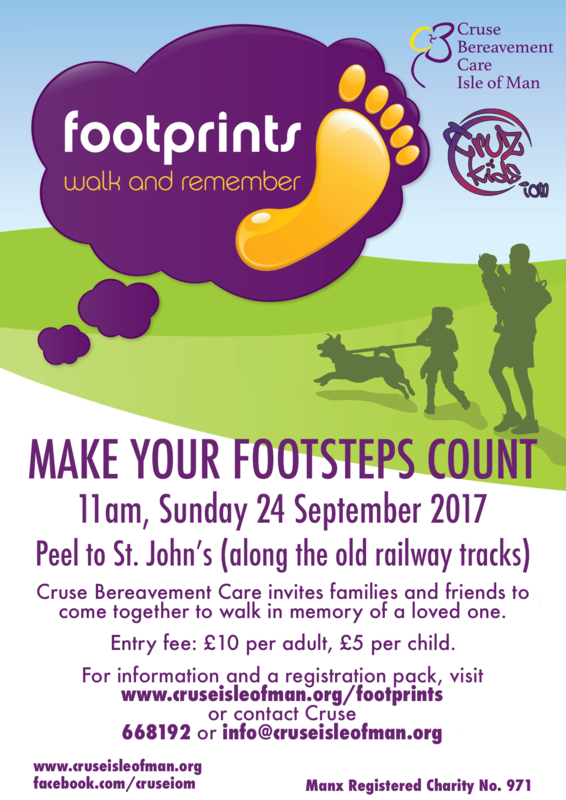 This year's Footprints walk will take place come rain or shine at 11.00 am on Sunday 24th September, 2017 (registration from 10.30 am) and will be from Peel to St John's, along the Heritage Trail which follows the old railway track. The walk is about 4 miles, along a flat route that is suitable for all levels of walkers. We would like to invite everyone to come together and walk in memory of a loved one, and to enjoy a scenic, healthy and fun few hours with family and friends while also supporting the important work of Cruse Bereavement Care. The entry fee is £10 for an adult and £5 for a child. Everyone is also encouraged to raise sponsorship money, and a sponsorship form is enclosed with the registration pack. But don't worry if you can't collect sponsors - just come along on the day and enjoy the walk! To make sure we can start on time on the day, we ask that everyone registers in advance. You can download a registration pack here, and please feel free to contact us if you have any questions about the event. Starting on Saturday 10th September, we will be holding group drop-in bereavement support sessions every Saturday afternoon from 2pm-4pm. These sessions will be led by two trained and experienced bereavement volunteers, in a safe and confidential environment. 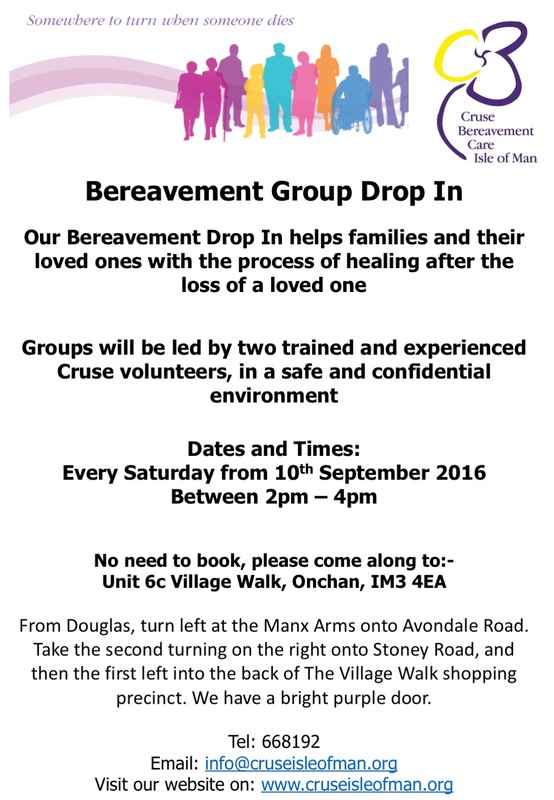 There's no need to book - anyone can just come along to the Cruse office in Onchan at any time during the sessions. We are very proud of Lizzy and Zoe, CruzKids members, who have both graduated from university this month. Both Lizzy and Zoe have also raised funds for Cruse in the past - Lizzy ran the Great North Run and Zoe did the Parish Walk. Please read their stories below. Lizzy's older sister, Eleanor, died in 2007 of a rare condition called Wegener's Granulomatosis. Lizzy was only 11 years old and described how she sometimes felt really angry, sometimes really sad and that she felt like there was a big hole inside. Soon after Eleanor's death Lizzy started receiving 1-2-1 support with Cruse and over the years has been a regular and enthusiastic supporter of the CruzKids programme. 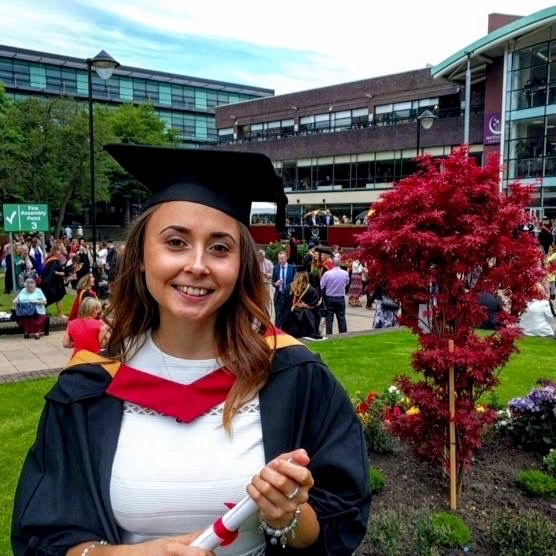 She is pictured recently at her graduation ceremony at Northumbria University where she received a 1st Class Honours Degree in Occupational Therapy, describing her career choice because she simply "wants to help people". Zoe's dad died of Multiple Myeloma, a cancer of the bone marrow when she was only nine years old. As is the case with many children, as Zoe approached teenage years the reality of her loss really hit her and she sought support from Cruse to help her deal with the new feelings she was experiencing. Zoe was pleased when the CruzKids programme was set up and she realised that she was not alone. 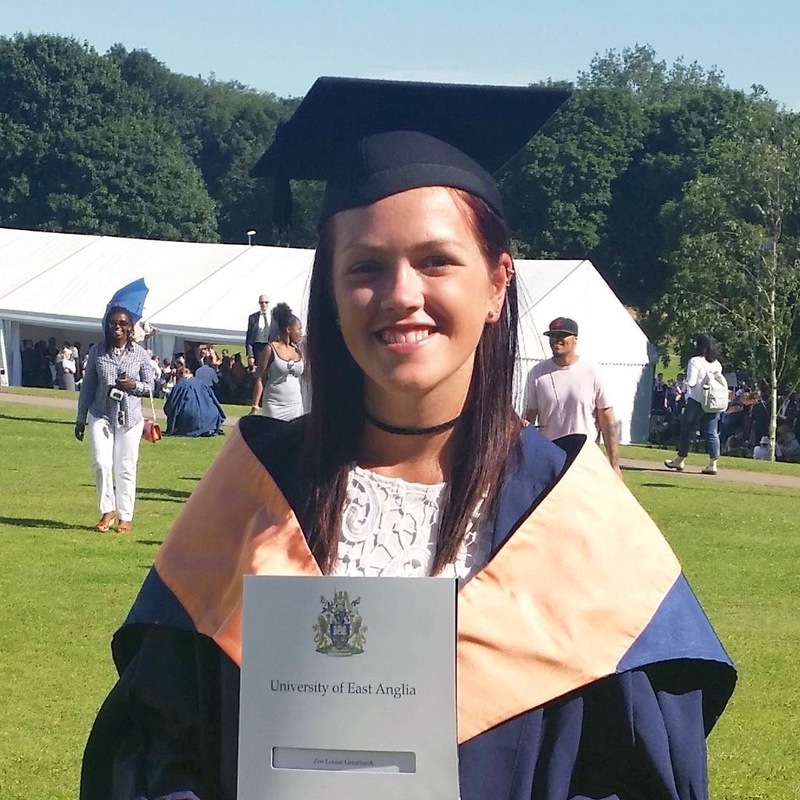 Zoe is shown at her graduation ceremony at the University of East Anglia, where she received a 1st Class Honours in Drama. She is an accomplished actress, but Zoe has a strong desire to help those less fortunate than herself and in September continues her studies at Southampton, training to be a Special Needs teacher. Well done on your achievement girls, you really both are amazing!